save money like a dirty …. CAN you write a prize-winning last line for that jingle at the top of the page? You can test your skill as a jingle genius on this limerick. It comes from an actual contest that the A & P Food Stores ran some time ago for their product Nectar Tea. You’ll be surprised to find out just how much you don’t know about composing the pretty little words that snag big money in advertising contests. Beat your brains with the dictionary, chase up rhymes with the biggest thesaurus you can find, then compare your masterpiece with the line that really copped the big cash prize. You’ll find the payoff line printed at the end of this article. Meanwhile, we’ll try to give you the inside dope on how contests actually are won. 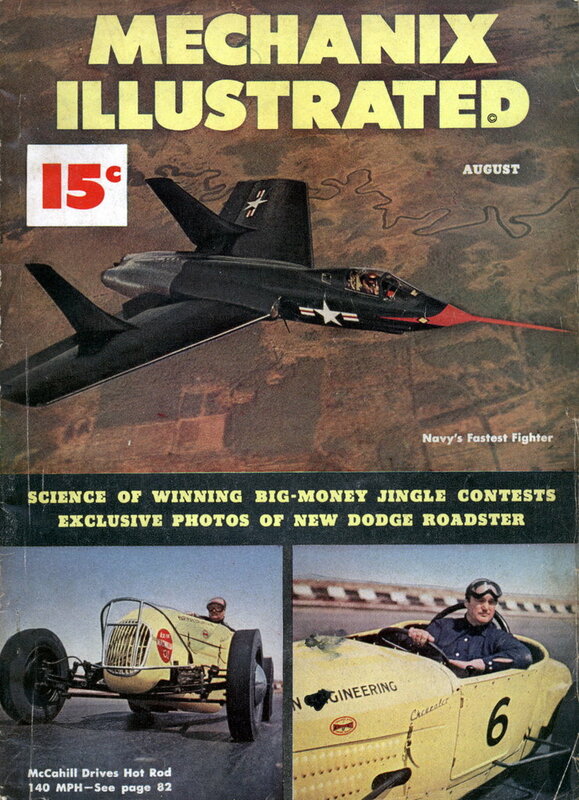 As a matter of fact, you have as much chance of winning a worthwhile prize in any commercial contest as you do of winning the Indianapolis race in a Kiddie Karâ€”unless you know what the particular contest is all about, how it is judged and the special methods consistent winners use. Contests, though, are definitely not phony. Since their operation depends on the U. S. mails, they come under the watchful eyes of the Post Office Department. So, they must be on the level. Sponsors offer prizes to promote the sale of their products, but that purpose is perfectly legitimate. Nobody can reasonably object to making a small purchase to compete for big awards. Having won hundreds of prizes myself during 12 years of steady contesting, I can assure you that inside knowledge of the technique is essential if you expect to win. I had to dig up my own dope gradually through trial and errorâ€”for I am one of 50,000 regular prizewinners who follow contests as a hobby. I even met my wife, Selma, through our mutual interest in winning prizes. We are two of the more successful among 30,000,000 Americans who compete for a share in the $50,000,000 jackpot now offered every year. Jingles, of course, are just one variety. Most often that jingle will be a five-line limerick with the fifth line left up to you. When you tackle a limerick, make a careful study of those lines the sponsor gives you for free. Repeat them over and over, so that you get the basic beat or swing. Try to grasp the plot or theme of the jingle so that your own final line will follow through logically. Familiarize yourself thoroughly with the product involved. Buy it, use it, observe its qualities. Notice what the advertiser himself stresses. The next step is to make up a list of appropriate words and phrases to describe the product and your reactions to it. Your last line must rhyme with the first two lines of the limerick. It must also have the same rhythm or accent. But in addition to these purely mechanical requirements, you must give your line some distinctive feature if you want it to have a chance at the jackpot. All your cleaning is easy as pie When Old Dutch is the cleanser you buy. It’s new and it’s quicker, And safer and slicker . . . Kitchen tools gleam like jewels the first try. TWO CAN DRINK CHEAP AS ONE THIS KEEN WAY. High-test Oxydol’s a delight, Said a clever young housewife named Wright. In my washing machine . It gets clothes so clean . .. OLD OR NEW, LOTS OR FEW, COME OUT BRIGHT. American. Buslines is new, We give fast, friendly service to you; Our bus fares are low Wherever you go . . . While your heart beats strong and true, There’s something great you have to do; Fight heart diseaseâ€”help find the key . . . LET HEART AND HAND GIVE READILY. Miss Sautner spent several evenings composing last lines and finally submitted three of her most distinctive entries. You’d think her contribution would be practically lost among the 100,000 other suggested lines. Her trick of alliteration, however, stood out among the flood of plain-worded entries and made a hit with the judges. GUARDS EXPENSE LIKE A SCOT ON THE DOLE. Sometimes it pays to write your entry in verse even if the contest isn’t advertised as a jingler. 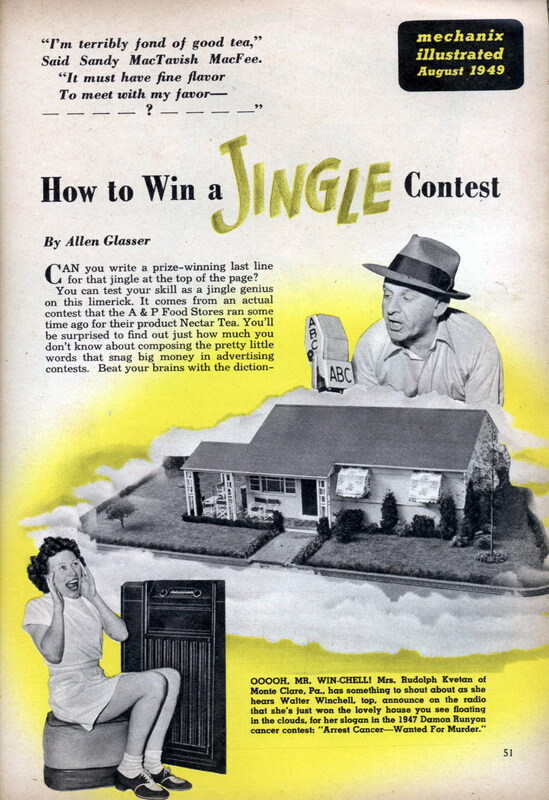 Writing jingles really isn’t very different from writing slogans or statements which form another big group of contests. If you want to dream up a prize-winning statement about a breakfast food, for example, you would go through the same process of familiarizing yourself with the product, then making up word lists to describe it. You might include in your list expressions such as these: nourishing, appetizing, tasty, tempting, hearty, zestful, savory, delicious, inviting, full-flavored, energy-rich and wholesome. Now that you have your word-tools, you need a blueprint to guide you in building your entry from skeleton to finished form. Let us take a look at a few models that demonstrate winning ways to compose your entry. In this way you can also repeat words similar in sound as you did in jingles. You can use this Triplet Trick for any statement contest no matter what the subject. Once you’ve really learned how to use it, you will have a tremendous advantage over other contestants. I am really thankful for sharing such a wonderful techniques with us about winning of jingle contest.